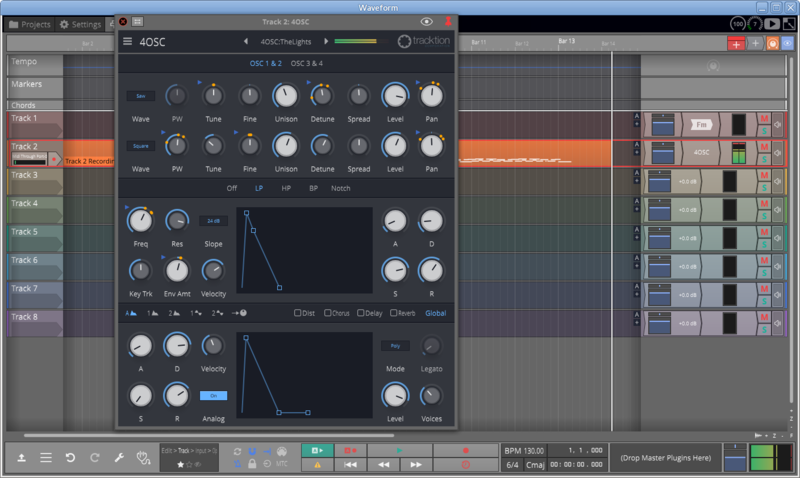 4OSC is a realtime monophonic/polyphonic virtual synthesizer included with the purchase of Waveform 10. Developed and maintained by the Tracktion team, 4OSC is a subtractive-approach plug-in to be used within the DAW itself. It is cross-platform, and currently available for the Ubuntu and Debian flavors of linux. As the name suggests, 4OSC provides four oscillator sources, arranged in pairs in the top section of the synth GUI. The selected pair of oscillators is indicated by the lit OSC 1&2 or OSC 3&4. The oscillators provide the traditional subtractive synthesizer waveforms: sine, saw, square, triangle, noise, and can be individually activated and deactivated. All four oscillators also include: pulse width modulation (when square wave is selected), step semitone (plus-minus three octaves) and smooth fine tuning (plus-minus one semitone), unison, detuning of the unison amount, spread, amplitude level and panning. The central section of 4OSC provides the filter controls: 12dB/octave and 24dB/octave filters for Lowpass, Highpass, Bandpass and Notch (Band-reject). Cutoff, resonance, filter key tracking, envelope amount (positive and negative) and filter velocity sensitivity are all provided, along with a standard ADSR envelope. The lower section of the GUI provides three additional ADSR envelopes (adjustable, as with the filter envelope, both with dedicated knobs and by dragging the points in the graph window). One is hardwired to amplitude, whereas the other two envelopes are assignable. This section also provides 2 LFOs (with sine, triangle, square, saw-up, saw-down and sample-and-hold waveshapes) and an effects section. The display changes according to the current modulator selected. Most of 4OSC's controls can receive modulation signals, and a small blue arrow will appear next to any control that is being modulated. The circle icon to the right of the LFOs, when clicked, will display the MIDI CC setting window for interfacing with a hardware controller. The effects section to the right of the graph offers Distortion, Chorus, Delay, Reverb and the overall amplitude setting, with poly/mono/mono-with-legato options and number of notes when poly mode is selected.